When Benni Lui came to Australia as a kid over 40 years ago, he and his family were thrown straight into the hospitality industry, learning the restaurant ropes from an early age. After his awesome first venture Seoulja Boy, Benni decided to branch out and share his love and knowledge of Japanese eating and drinking culture. And that's how Yokocho was born. This Japanese eatery is minimalistic and simple, but for good reason. Benni wanted the space to be “somewhere people could come and chill out.” He thinks, “People should see the décor and not feel like they have to come and dress up here.” The balcony overlooks Bourke Street and has indoor seating that’s just as lively, making it the perfect location for both after work drinks or a quiet lunch. The food is traditional Japanese, with modern quirks that'll blow the geta sandals right off your feet. Everything looks too good to eat, so make sure you get some snaps on before your eyes pop out of your head. Let’s get stuck into the menu. We recommend getting a share plate of all three traditional Japanese dishes on offer at Yokocho— sashimi, tempura and yakitori. The assorted sashimi is full of beautiful blushing salmon and tuna belly that literally melts in your mouth. Your favourite sushi rolls are on there, too. The next thing you NEED to order is the assorted tempura. Benni puts it simply (“everyone loves tempura”) and he’s probably right. Think puffy, golden shitake mushrooms, prawns and eggplant with a light dipping sauce. The Yakitori is basically a smoky, Japanese-style BBQ with any type of meat you can think of, from pork belly to chicken thigh and everything in between. If you’re feeling adventurous, go for the beef tartare. It’s raw, but it’s damn good. And not commonly done in Australia either, so you’ll gain some bragging rights for giving it a go. 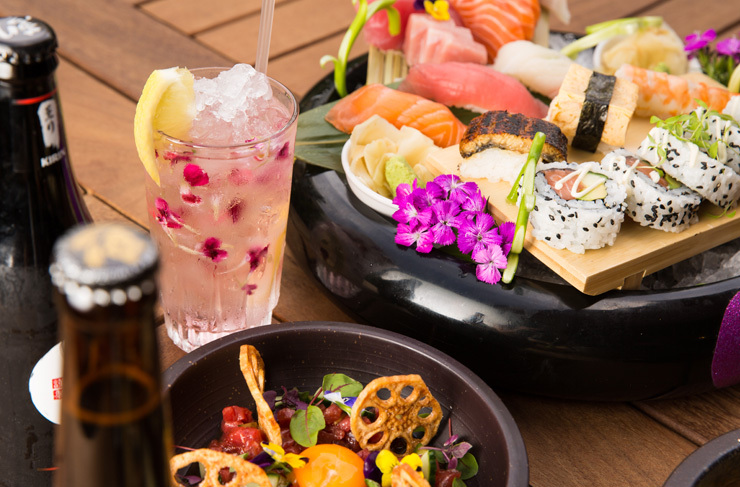 Of course, no dining experience in Melbourne is complete without some bevvies, and Yokocho has you sorted. The drink menu sits inside an anime DVD cover, designed especially for Yokocho and encapsulating an important part of Japanese culture (while also being cool as hell). Grab a sake bomb, which is a cocktail jug, spiked with traditional sake. If you’re not game enough, there are plenty of cocktails that are “authentic with a unique twist”. Our favourites are the Sakura Collins and the Sake Spritz. Not only are they refreshing, they go perfectly with the Japanese flavours on offer. Vibrant Japanese street culture is reimagined here, creating a lively but somehow also relaxed atmosphere and serving up traditional food that is still modern enough to please the fussiest of eaters. Want to know more? check out our directory page here. Kate hopes to spend her life jet-setting and aims to watch every single musical ever created. She believes a combination of espresso martinis and a good Beyoncé song is the key to happiness.